I think this is my favorite piece of artwork so far this holiday season. I didn’t know Delaney could draw such awesome trees! We’ve had a stack of watercolor paper, pastels, watercolors, and sequins sitting out for whenever the mood strikes. I had to cut out this tree and mount it to show off its adorable shape! This weekend we are looking forward to Delaney’s first ballet recital, Babes in Toyland. There are also plans to drive around looking at lights, and do some wrapping and teacher gift-making. Should be a lovely weekend! 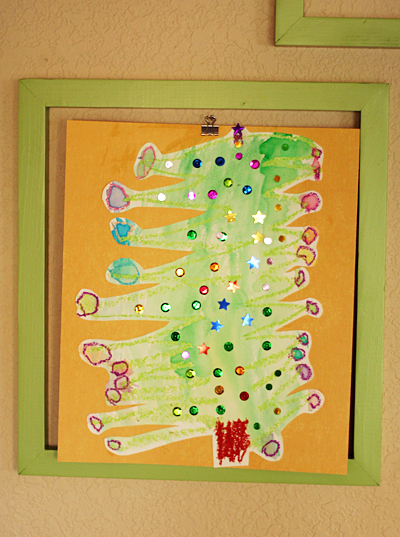 It’s an awesome tree (the sequins are the best part) (as well as the shape), but…I want to know more about your art hanging system there! Have you posted about this before and I missed it? How does it work? Do you have open frames that are on a corkboard or something? Or a frame on a wall with a nail for the binder clip?